The groom’s wedding suit should fit like the couple it was made for. When people pass by you, the first thing they notice is what you’re wearing. Style is crucial. It’s not so much about simply having a branded suit, shirt, or jacket. Rather, it has to do with the fit. An expensive and luxurious suit can be eye draining if it does not fit properly. On the other hand, a manufactured suit can look fantastic if it is fitted right. To get the right look, you need a tailor. But not just any tailor, but one that knows about timeless fashion, classic-fitting, and current trends. You want to look for a tailor who can help you make decisions on the right fit and give you valuable style advice. The first thing you want to do is educate yourself. You want to have a good foundation of knowledge to create the right look for your wedding day. 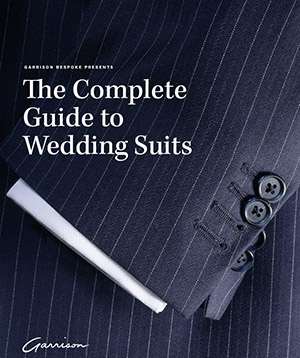 For tailored suits, find out how stylish grooms (click here for examples) are wearing their suits: observe the fit, the length of their clothing, the colours, and, the overall sizes of detailing on their suits (e.g. the sizes of the lapels, the sizes of the ties, and etc.). The goal isn’t to become an expert in fashion; the goal is to communicate what you want to your tailor. The right tailor will be able to take that information and transform it into a work of art. Once you’ve figured out how you want your wedding suit or tuxedo to look, the next step is to do your research on the tailors. Recommendations through word of mouth are a great start. Be careful, however, as most men aren’t so sure themselves on what the right fit is — they might refer you to someone who they think is great, but, in reality, is not an expert in men’s tailoring. Look to recommendations from your stylish peers as they may provide you with a good source. Next, do some research online. Find tailors around your area and read reviews. For small businesses, chances are, they may not have a full internet website– try visiting them at their store. (To locate their store you could do internet searches on tailors around your area and the addresses of various shops should pop up). Ask the tailor questions about how a suit should fit and see if they have any examples of their completed work. Then, based on your background knowledge of the tailor, you can judge if they are suitable. Without this knowledge, you can’t guarantee that the tailor will deliver what he offers. Note: Many tailors in business are out of date with contemporary styling. They may be experts at sewing and creating garments, but are out of touch with how a garment should properly fit — you need to find a tailor who can layer modern pieces over a classic foundation. A satisfactory tailor takes a measurement and classifies your body in a generic way (e.g., large, thin, and tall). A great tailor will listen to you, give you direction and guidance, and will suggest the right fit for your body measurements. Lastly, a great tailor will take the time to get to know you personally in order to understand your lifestyle and how that relates to the look you wish to create on your wedding day. Lastly, you shouldn’t let the price of a suit be your main concern when selecting the right tailor. We’re not suggesting that you recklessly disregard the price, however, we do suggest that you keep an open mind when considering what a quality piece is worth. It’s always better to get your suit tailored properly the first time, rather than having to waste time and money later on, fixing a poorly tailored suit. Garrison Bespoke has been a master tailor for performers, athletes, and businessmen. We will be able to determine everything about your body shape and how to personally tailor your suit. Book a free consultation today, or pay us a visit and to have all your questions answered.